Now, that's what we call good pricing. ASUS is one of the few who have managed to undercut Apple and offer a powerful 10-inch tablet for less than the price of the iPad 2. Add to that the raw power of NVIDIA Tegra 2 powering Android 3.0 Honeycomb and you have plenty of reasons to get excited about the ASUS Eee Pad Transformer. The tablet was confirmed for release on April 26th in North America with a price tag of $399 for the 16GB version and $499 for the 32GB model. In addition, you can purchase a keyboard dock which doubles as charging station and comes equipped with two USB 2.0 ports, a 4-in-1 card reader and improved sound all for $150. The dock adds an amazing 8 hours of battery life so you can squeeze up to 16 hours of your tablet counting the slate's own battery capacity. The Transformer might not have the slim profile of neither the iPad nor the upcoming Samsung Galaxy Tabs, but it's nevertheless well-designed with a solid metal finish. Finally, it comes with an ISP screen with resolution of 1280 x 800 pixels, matching the resolution of recent Honeycomb tablets. For a limited time you can actually win two Transformers by sending a tweet including @ASUS and #EeePadTransformer or liking the official ASUS Facebook page. Is that enough to tip the scales in favor of the Transformer for you? Let us know in the comments below. Good I am so glad this didn't get pushed back. I will have this tablet. I don't care about the size or how slim it is, has long as it is fast & gets decent battery life I am all about the Asus Eee Transformer. I will wait for the Samsung 8.9 Galaxy Tab for my wife. She wants something small & flashy. Something she can fit in her purse! Now if they make a 7 inch dual core Honeycomb Galaxy Tab then I will get that one instead. Let's hope for that to materialize! Yes!!! This is the perfect tablet to me, all that power and still the "low" price, why can't any one else manage to do this. I am going to wait for the galaxy tabs pricing and if it's any amount over 499 then I'm gonna toss that idea out the window and get this tab right here. Sounds line a good plan to me. Why pay more if you don't have too. Good for you. Asus is a good company! Wow, this comes out just in time for me to return my Xoom tablet. It's great but the Asus is just that much better and still LESS expensive!!!! Well done Asus, a few more tablets like this will tip the numbers in the Android direction! ASUS hit the sweet spot here. 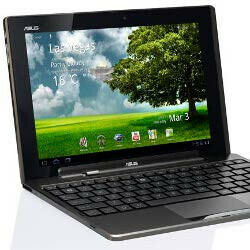 If the reviews come out okay for this tablet and the ASUS UI doesn't interfere too much, then it will be a sleeper hit. I suppose one issue may be after market accessories like a case, but if Best Buy ends up carrying it that shouldn't be a problem. Good job on price!! That's what I'm talking about!, finally a reasonably priced Android tablet, plus that optional keyboard and battery, sounds like a winner to me, Motorola and the rest gotta be more competitive or else, average people will(potential mass sales) notice this right away, well done asus! The only other thing I could ask for is to finally have a Netflix app on Android!